Injap Sia's BGC Condotels Priced at Php5-M With Projected Yields of 4.3%-10.8% p.a. 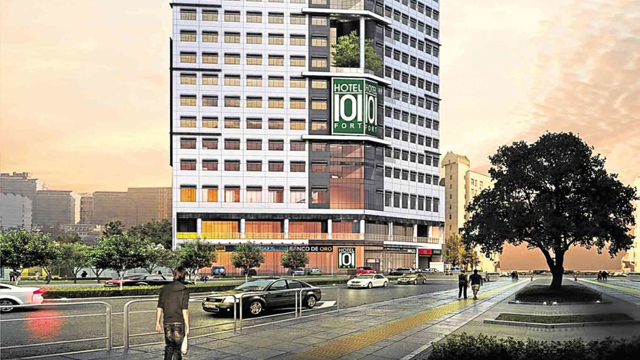 Hotel of Asia Inc., the hospitality arm of listed real estate developer DoubleDragon Properties, launched its second condominium hotel project, Hotel 101 Fort, on March 14. Pre-selling of the condotel units have officially begun, with each unit costing Php4,975,000. Headed by DoubleDragon Chairman and CEO Edgar “Injap” Sia II, Hotel 101 Fort is a 33-story building with 606 rooms and 188 parking slots. It will feature a three-level podium with the first and second levels being reserved for retail shops while the third level having amenities such as a pool, gym and spa. Construction officially began in 2017, and the project is slated to be completed by 2020. Hotel 101 Fort will follow the “condotel” concept when managing its units. This allows prospective real estate investors a more passive but similarly lucrative investment option. While they technically own the unit like a condominium, handling of the room—which includes marketing and maintenance—will be shouldered by Hotel 101 management, similar to a regular hotel. 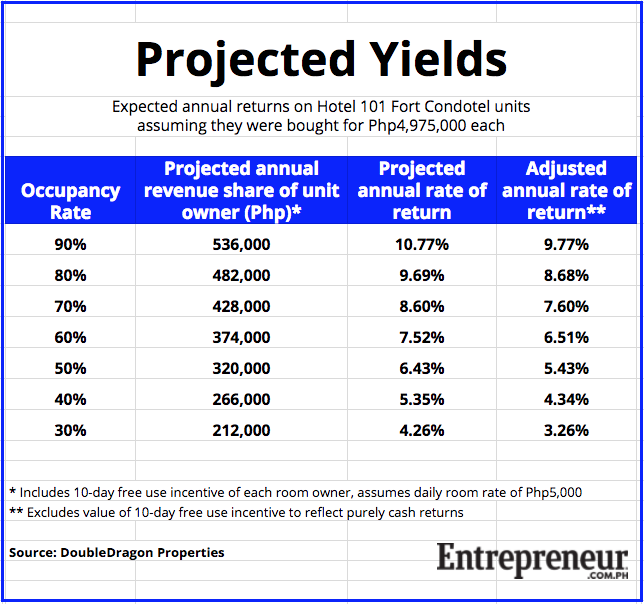 In this setup, Hotel 101 Fort unit owners will earn from their condotel investments depending on the average occupancy rate of the entire hotel—not just of their individual units, unlike residential condominiums or other condotel projects. Each investor will earn a monthly income of 30 percent of the hotel’s total gross room revenues less value added tax, divided by the total number of hotel units. The remaining 70 percent will go to the hotel. Hotel of Asia released a table outlining this scheme, which is shown in the infographic above. Assuming an occupancy rate of 90 percent, each unit owner is projected to earn Php536,000 in room revenues per year, an annual return rate of 10.77 percent. That includes the 10-day free use of rooms given to each unit owner, which is valued at Php50,000 a year. Without the incentive, investors can expect a maximum annual return on investment of 9.77 percent. On the other hand, if occupancy rate falls to only 30 percent, the annual return also drops to 4.26 percent if the 10-day incentive is included or 3.26 percent if excluded. Such a model is already in play in Hotel of Asia’s first major project, Hotel 101 Manila in the Pasay Bay Area. Data from DoubleDragon Properties revealed that average occupancy rate for the property stood at 74.8 percent for 2017, rising to around 80.1 percent in the fourth quarter. As well, investors who bought a unit in Hotel 101 Manila for Php3 million earned an average yield of 6.23 percent between March 2017 and February 2018. Hotel 101 Fort marks the continuation of Sia’s aggressive expansion into the hospitality industry, as it is only one of four Hotel 101 projects in Hotel of Asia’s pipeline. Last February, the company announced that it had entered into a joint venture to develop Hotel 101 Resort-Boracay, which will span 1,001 units. In DoubleDragon’s annual report, the company also mentioned that it is currently planning two more Hotel 101 projects in Bohol and Davao, which have 502 and 519 units respectively. In 2017, DoubleDragon’s hotel revenues stood at Php397.5 million. While that represented only six percent of the company’s total revenues of Php6.6 billion, it also experienced the highest year-on-year increase among revenue segments, growing 403.8 percent from the 2016 figure of Php78.9 billion. “DoubleDragon envisions being one of the leading hotel players in the country and is looking to increase its hotel roombase to 5,000 hotel rooms by 2020,” wrote DoubleDragon in a press release dated March 2.